1. What is Direct Access? Direct Access a solution for encrypted remote access and remote management of UiTs Windows computers. Compared to traditional VPN this solution is seamless and transparent to the user. The users only need an Internet connection and to logon to the computer with his UiTs user information. Communication with the client is bidirectional, allowing the IT department to manage computers remotely. 1.a What benefits does Direct Access provide for you as a user? Software from Software Center can be installed outside of the University network. The solution only works for computers managed by ITA, limited to Windows 10 Laptops members of the UiT domain. For the solution to work it demands the user to log on to the work domain and not a local user account. The solution does not support MAC and is for employees only, for other clients and users you are adviced to use VPN. 2. 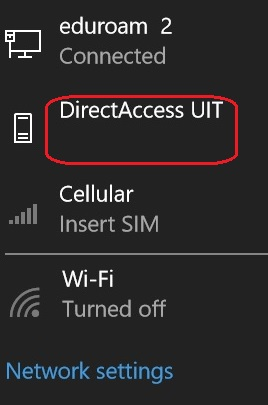 How to tell if Direct Access is enabled? After logging in, click on the network icon on the right side of the taskbar. 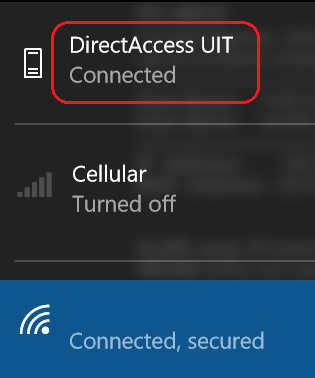 This status means that Direct Access is enabled and connected to UiT. If the status is «Connecting», the connection process is not finished. This could take 15-30 seconds. This status (no text) means that you are either disconnected from Direct Access or you are actually connected to a local UiT network. 3. How to disconnect Direct Access manually? If you don’t want the computer to have access to your work resources you can click the DirectAccess UiT status (1) and the opportunity to disconnect (2) will become available.